Access to major turnpike and Seacoast area. Strafford Regional Planning Commission (SRPC) completed their regional master plan per RSA 36:47, which requires regional planning commissions to prepare a comprehensive master plan for the development of the region. Early in the regional master plan update process, we heard from our Regional Advisory Team and municipalities that communities wanted a document which did not prescribe local policy recommendations, but enhanced the capacity of municipal officials, staff, partners, and other stakeholders to plan for the future through information, tools, and guidance. In response, and with the guidance of the Advisory Team, staff identified two primary objectives for the regional master plan that supported the goal of maintaining and enhancing quality of life in the region: a) develop a document that reflected and showcased the ideas and aspirations of residents in the region, and b) provide data, case studies, best practices, and strategies that would support decision making, sustainability, and collaboration at the local and regional level. SRPC staff reached over 1,300 residents through outreach events, focus interviews, town and city meetings, and other venues. This process laid the foundation for the plan’s components, informed the vision statements for the plan and each technical appendix, and provided valuable insight about assets and opportunities. The regional trends summary, discussion of outreach results, and community narrative sections of the plan describe the character of the Strafford region. This included its context within the northeast; current demographic, land use, and transportation conditions; and examples of people who make the region a great place to live, work, and play. The plan is designed for diverse audiences. Elements such as the three page executive summary for each technical appendix provide a reader friendly synopsis of each technical section. Finally, the implementation table lays out action steps to improve quality of life in the region through data collection, analysis, and dissemination; outreach and education; partnerships; technical assistance; and internal organizational development. This data-driven nature provides the eighteen unique cities and towns within the Strafford Region with the flexibility to use the information in the plan for a variety of purposes. 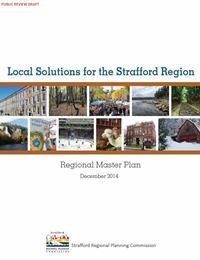 A complete copy of Local Solutions for the Strafford Region can be download files at the SRPC website.